I don’t care if he did serve two non-consecutive terms, I don’t think Grover Cleveland should be the only president to get two coins. Since they both come out in 2012, I suppose they’ll have to use two portraits just to differentiate them. So I got to meet Nathan yesterday. Well, “meet” is a little strong. I got to see Nathan for a while, through a window, from several feet away. Hopefully we’ll get to do a bit better than that soon. Nathan is my nephew (my first official nephew, even if I’m already “Uncle David” to my future sister-in-law’s children. [For the record, I like being “Uncle David.” A lot.]). More fully, Jonathan McDonald Hitt, Jr. He was born yesterday afternoon. Six pounds, 13 ounces. Nineteen inches. And he is, of course, adorable. I got to visit with Jonathan and Erin for a while. They’re doing well, and Erin looked great. I was very glad that I got to share the experience with Susanna; that she was there with me to go up and talk to Jonathan and Erin, and that we were together to see Nathan for the first time. And, while we weren’t married when they were born, and thus not technically the aunt or uncle from the beginning, for Radford, born in July, and Nathan, born yesterday, Susanna and I will just always have been their aunt and uncle. And that’s very cool. Going to see a new niece or nephew for the first time is such an incredible thing. To walk into the building, having not seen this person, and yet already loving them wholeheartedly. It’s just kind of weird. Anyway, enough rambling. Welcome to the world, Nathan! I look forward to getting to know you! OK, so maybe I spoke too soon on Friday. We’re re-evaluating Easter, and the location. We’ve been running ourselves ragged for weeks, and finally had to step back and figure out whether or not this is really doable, or sane. We’re going to Louisiana this weekend to meet with her family, and will figure out then something we really feel comfortable with. It’s weird going back to Square One, but I think we’re both happier today than we have been recently, and that’s a good thing. Susanna has considered changing blogging approaches with the impending marriage; one of the ideas that was discussed was a joint blog, that would basically just have her posts and my posts intermixed. I mention that because if we were doing that now, readers of this blog would actually know about the wedding, since she writes about things like picking a date and where planning stands, and even stuff like china pattern decisions and how I proposed in the first place. I, on the other hand, did mention that we set a date. Fortunately, I’m marrying an incredible woman. It has been amazing for me to see this wedding coming together from nothing hardly any time ago at all. I’ve been every so slightly involved, but in saying that feel very much like the kid from the old Shake ‘N Bake commercial: “It’s a wedding! And I helped!” Yeah, I’ve done stuff like aim the gun while we register, but have no delusions of having made material contributions to this thing, other than, maybe, the occassional “Why don’t we …?” when challenges arise. Susanna, on the other hand, stays not only five steps ahead of me in all of this, but from my seat, appears to be a step or two ahead of the game. “Have you thought about…?” “Yep, it’s already done.” It’s an awesome thing to watch. It’s also incredible to see her heart on display through all of this. This is our big day, and, even beyond that, her big day (and I really want it to be exactly that), but whenever she can, she tries to defer to the happiness and wishes of her family or my family or other stakeholders. She’s a very sweet, generous person with a very kind heart — something I’ve long known — and it makes me realize how blessed I am to see it in action now. Sure, there have been moments when it’s been frustrating for her, and I’m slowly working to be more supportive in those times, but she always quickly bounces back, works the problem, resolves it brilliantly, and moves on. As her friend for months, I saw these skills on display when she was off being incredible at work, but it’s kind of different and far more rewarding to be on the receiviing end of that brilliance. Uh, sorry, didn’t mean for this to be just me gushing. Still haven’t shared any actual info, huh? We’re getting married on Easter, which I’ve said. At the Huntsville Art Museum; on the porch facing Big Spring Park, which should be pretty. We’re registered at Target and Bed, Bath and Beyond. There will most likely be some sort of dessert reception. And, uh, that, really, is pretty much what I know. But I know it’s under control. OK, so as not to annoy Heather, I try to keep book-related posting on my other blog, All These Worlds. But this one’s a bit more personal, so it’s going here, instead. Sorry, Heather. The U.S. Space & Rocket Center here in Huntsville held its second annual Gala in the new Davidson Center, which holds the restored test article Saturn V. Last year’s Gala, which I was unable to attend due to being in Houston, celebrated the 50th anniversary of the launch of Explorer I. This year’s honored the “Year of Apollo” beginning with the 40th anniversary of Apollo 8 back in December and continuing through the anniversary of the first lunar landing on Apollo 11 this coming June and on to 40th anniversary of Apollo 12 in November. Owen and I had been interested in holding a booksigning at the Davidson Center for a while, and, in discussing it, had come up with a couple of ideas we were proud of. We should use the booksigning as fundraiser for the Skylab Trainer restoration project, of which I’ve been a long-time advocate, both financially and in early-Saturday-morning-sweat-equity. And, we should not only tie it to the Gala, but convince USSRC to bring in some of the other guys for the event so they could sign, too. As a result, Owen, Joe and I were joined by Alan Bean, who donated his diary to the book; Homer Hickam, author of “Rocket Boys” (aka “October Sky”), who wrote the foreword; and Jack Lousma, who served on the II/3 crew with Owen and Al. 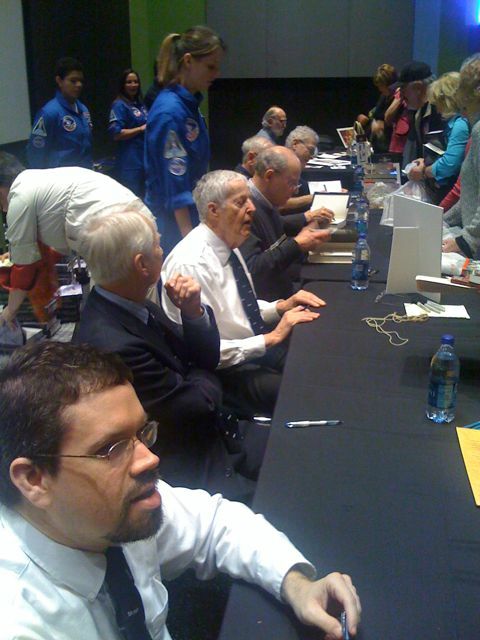 I have been to a pretty fair number of book signings over the years, and a few astronaut signings as well. (Ever try to get your astronaut signed? Not always easy.) So to be sitting at the table myself? Alongside that sort of company? Amazing. Just amazing. Definitely a sense that I was an imposter or something. But it was still an honor to be there. The sense that I was an imposter was helped by the guy who skipped me in the signing line for my book. He collects books signed by astronauts. ONLY signed by astronauts. Um, OK. On the flip side, there were people who didn’t buy the book, but wanted my autograph on stuff anyway … other books, postcards, etc., so that more than made up for the other guy, who amused me more than anything. Some museum officials told me that evening that it was the biggest booksigning they’d ever hosted. I don’t know how many books we signed, but the line stretched all the way to the back of the new auditorium at the Davidson Center, across half the back, and then halfway back down the side. My hand was approaching tiredness by the end. Along with getting to sign alongside such distinguished company, it was also a huge honor for me to get my book signed during the event. There were a couple of people who talked to me as I was signing their book about their work on Skylab, and I would pull out my copy, and have them sign it. They, after all, are the true authors of this story. And I have to also mention how appreciative I was and am of my incredible fiancée. Generally at astronaut events, they have handlers for the astronauts who keep the line moving expediently os the astros can get done and move on as quickly as possible. The most efficient of these can limit interaction to a bare minimum, and have earned the affectionate tag “Astro-nazis.” Saturday, I had my own personal Astro-nazi. With no one at the line to help us, Susanna stepped in and helped keep things moving — taking people’s books, making sure they were turned to the right page, finding out if they wanted them inscribed and, if so, how the names were spelled, and then telling people what they needed to do. It was a huge help, and almost certainly made a huge difference in keeping the line moving. Thanks! OK, let me point out again that I was sick all day, and had really been unsure as to whether I would come back for the actual Gala. I felt obligation to go to the signing, the Gala would be pure pleasure. Fortunately, by the end of the signing, drugs and excitement had deluded me into thinking I was doing much better than I was (I ended up drooling in front of an astronaut before the evening was over, and not for usual space-awe reasons) and so we decided to continue on to the Gala. And I am so glad we did. The Gala was amazing. If they had planned it for me personally, they couldn’t have done a better job. First, they put me at a table with Bob Schwinghamer. I could try to explain to you how cool that is (and I may have mentioned him in my recent library lecture post), but couldn’t do it justice. Just read the book. The man is amazing. At one point during the dinner, they asked people to stand if they had been involved in supporting NASA missions — Mercury, Gemini, Apollo, etc. I technically could have — I was mission-involved for STS-118 — but standing next to Bob Schwinghamer? I would have been a fraud. I was just as proud to sit. The first speaker was moonwalker Alan Bean, who, as I said, contributed a lot to the book, and whom I really like, so it was great to hear him speak. To say nothing of the fact that the man is just a great speaker, and so NASA-positive. Hearing him talk, I was overwhelmed by how proud I am — how incredibly proud I am — to wear this badge. It’s something I always know, but it’s wonderfully when the occassional opportunity comes along to be reminded just what, exactly, this agency I work for is. It’s easy to focus on my little corner of it, and lose perspective of its true scope and heritage. Also that night, an award was presented to George Mueller, who was head of manned spaceflight during Apollo. Mueller has helped me with both the Skylab and shuttle books, and is brilliant. Skylab was in a very real way his baby, and showed a lot of foresight on his part. He’s also just a neat guy, and fun to talk to. So very cool getting to see him receive an award. Added bonus: Guess who they got to present the award to him? My co-author, Owen. Plus, while Owen was up there, he presented two new displays to the musuem. The first was the closest I will come to being Indiana Jones; I got to have my “This belongs in a museum!” moment. (Of course, it rarely actually worked out for Indy, but that’s beside the point. I think he managed to successfully recover one item in four movies.) 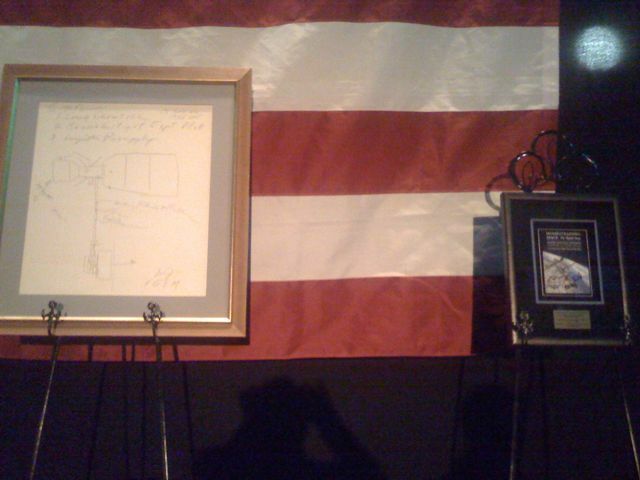 When we interviewed Lee Belew, the program manager for Skylab at Marshall, I noticed that he had the original flipchart sketch of Skylab — very likely the single most important Skylab document — framed on his wall. When I heard of his passing, I suggested that Owen contact the family, let them know what they had, and see if they would be willing to donate it. So it was very rewarding to see that come to fruition, and to see it being prepared for display here in Huntsville. (Where it should be, and where, per his family, Lee would have wanted it.) I also got to talk to Lee’s grandchildren, who were really great themselves. The other new display was a bit of more recent spaceflight history. Before Owen’s son Richard flew to the International Space Station back in October, we printed up some photo reproductions of the cover of our book and signed them. Richard carried them with him to the Station, and stamped them with the Russian ISS postmark. Owen donated one of the signed, flown and canceled book cover photos to the museum; earning my signature a place in spaceflight history. Again, kind of cool. And, after the program, I humored my very patient and supportive fiancée by quote-dancing-unquote afterwards. Like I said, all in all, just amazing. Truly amazing. 1) I wasn’t able to take the picture Susanna wanted of her with Alan Bean. 2) I wasn’t able to catch up with Ed Gibson to get him to sign my book; the one person who hasn’t signed yet but most deserves a spot, given his substantial contributions to the work. 3) I didn’t get a photograph of Susanna and I together in our fancy Gala duds. She looked fantastic. I mean, just stunning. Seriously. I fancy myself an odd blend of a technophile and a Luddite. I got an iPhone the first weekend it came out, but keep the ringtone set to the “old telephone” ring — I believe firmly that telephones should sound like telephones. My stereo system plays mp3s and LPs. I have a Blu-Ray player, but none of the variety of equipment to improve TV viewing — no Netflix downloading; I don’t use TiVo; etc. I probably inherited this from my parents. My dad got us an early home computer when very few people had them. My mom takes advantage of my dad going on business trips by turning off the power and pretending to be Amish. 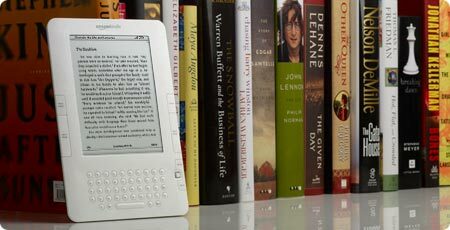 1) I abhor the Kindle, and all that it represents. Yeah, I’ve been quiet lately, but I’ve been dreadfully ill. I’ve hardly been out of bed in about four or five days. There was one major exception to that … the Apollo Anniversary Gala at the U.S. Space & Rocket Center on Saturday, and I do plan to post about that fairly soon. In the meantime, I’m trying trying to get back up to speed. Be back with you guys shortly.